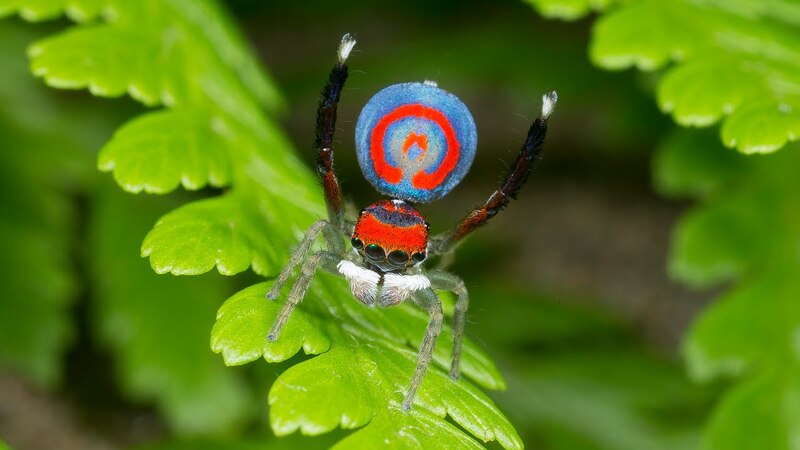 The Maratus spiders also known as the peacock spiders belong to the spider genus of the family Salticidae, regarded as the jumping spiders. Maratus species are small spiders, with a total body length mostly around 4–5 mm, with a high degree of sexual dimorphism. They are known as Peacock Spiders, based on the peacock-like display of the dorsal (upper) surface of the abdomen of the males, on which there is a "plate" or "fan" of usually brightly colored and highly iridescent scales and hairs, often forming patterns in which the foreground colors contrast with the iridescent background. There may in addition be "flaps" or dense fringes of hairs at the sides of the abdomen, sometimes brightly colored. In both sexes, the abdomen is joined to the cephalothorax by a long and very flexible pedicel. This allows males to raise their abdomens, which may also be capable of being flattened and waved from side to side, thus emphasizing the appearance of the dorsal pattern. Not all species have colors that appear bright to human vision; Maratus vespertilio is relatively cryptically colored, with most iridescence on the lateral flaps. The abdominal display is used in courtship and, in at least one species, also in aggressive interactions with rival males. In almost all species, males have relatively long third legs, often brightly patterned, that are also used in courtship displays. Salticid spiders have excellent vision, with the ability to see in at least two colors: green and ultraviolet (UV). The male display includes vibratory signals in addition to visual ones. At least one species (Maratus fimbriatus) displays with its first pair of legs rather than its third pair. Some Maratus including Maratus calcitrans, Maratus digitatus and Maratus jactatus display with greatly enlarged and decorated spinnerets when their abdomen is elevated. 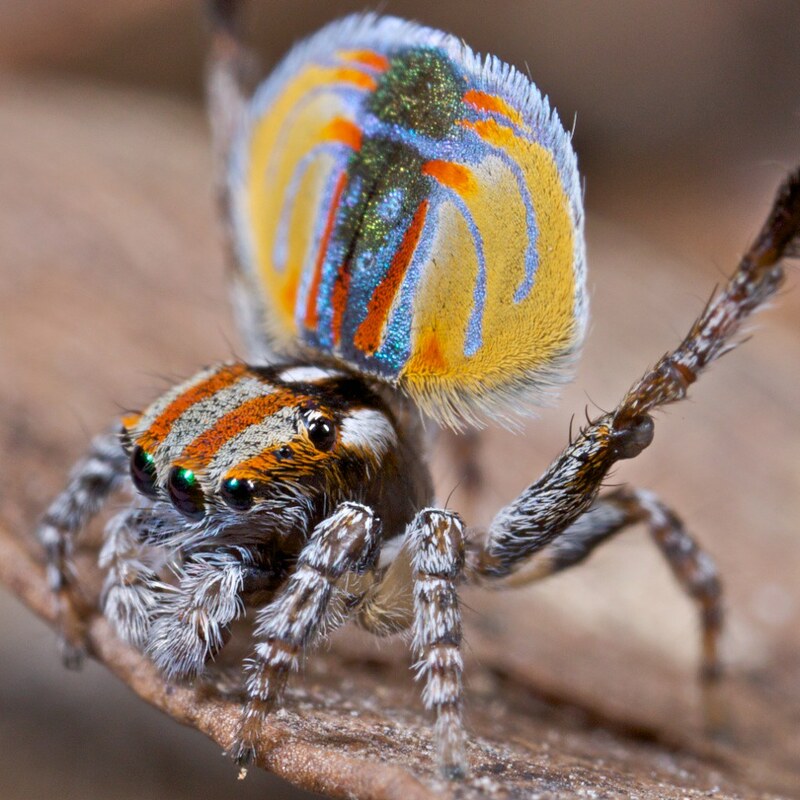 One species from Cape Riche, Western Australia, in a region which is something of a hot-spot for Maratus species, does not use its abdomen in its display at all, instead using a combination of decorated third legs and its bright blue face and fluffy white pedipalps. Male palpal bulbs are relatively simple in appearance, with a circular embolus, and are rather similar in different species. The palp usually has a simple retrolateral tibial apophysis with a blunt tip. In contrast to the brightly coloured and distinctive males, females are cryptic or camouflaged in appearance, with mottled patterns of whitish and brownish scales. The epigyne is simple, with a pair of circular "windows" (fossae) to the front and a pair of oval spermathecae to the rear. The long and flexible pedicel allows females to rotate their abdomens by more than 180° during mating.